Here it is! 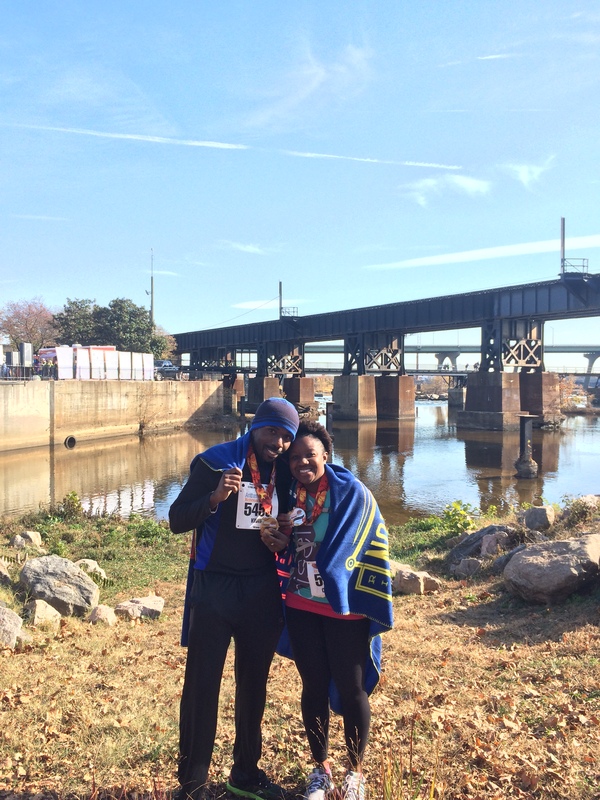 My Richmond Marathon Recap — if you missed yesterday’s post, that’s a great place to start. We left off with us at about mile 10 and I’d just shed my ear wrap and gloves. I was feeling pretty dang good, to be honest. Happy, moving at a great pace and excited that things were just rolling along. If you are looking for a marathon, you need to consider Richmond. It’s well organized, the people of Richmond are awesome and the course has so much support. You will love it. Now, back to the race! The race continued on and while I felt about how you normally feel 10 miles in, overall I was happy. I had forgotten how hilly some of those middle miles were and it was kind of fun to just push our way up the hills. The pace continued in the low 10s and the sun was shining. Richmond was out there in full force and I loved it. Around mile 14, I felt a spasm in my right calf. It caused me to stumble a bit and let out an audible “ouch.” K and Meghan asked what was wrong, I said I had a cramp but was fine. We kept on going. Unfortunately, my cramp kept on going as well. It got progressively worse as I kept running (duh, I should’ve just stopped the first time it hurt) and by the time I got to mile 16, I needed to stop and stretch. How can I describe it? It was basically like the most painful charley horse I’ve ever experienced…times 10. It literally made my knees buckle and brought tears to my eyes. We stopped on the side of the road while I cried a little as K tried to massage my legs. We continued on, at a slower pace, but it quickly became clear that the cramps were spreading and not going away. From that point on, they popped up every 1/2 mile or so. To put it mildly, it sucked. I was disappointed and for about two miles, I kind of was in a dark place. I was just so angry that after an amazing training cycle and doing all the right things, something so random and uncontrollable as leg cramps was going to sideline my race. Then…I got some perspective. I was running my THIRD marathon in exactly one year. My training had been excellent, my race (up until the pain) was great and I was healthy. I was doing something that not many people get to do and even fewer are able to do. AND I was doing it with my husband. How amazing is that? While K is faster than me in an all out sprint, I’m a faster distance runner and our plan was not originally to stick together. However, given that I needed breaks every half mile or so, it meant that we were going at a pace that worked for him. So, I got to run every step of my husband’s first marathon with him – which wasn’t the original plan. What a blessing. I am so proud of him and so thankful that we got to do that together. I can’t overstate what it meant to me to be able to share something I love so much (and yeah, I’ve accepted that I love the marathon) with the man I love more than anything. And, to be honest? After I had my 20 minutes of feeling sorry for myself – I embraced EVERYTHING about the race. I smiled the whole time – I ran fast when my legs weren’t cramping and walked when they were. I saw Bart Yasso one more time and that was awesome. I crossed the 22 mile marker cheerful and happy and remembered what a terrible place I was in at mile 22 last year. This year, I felt great. When we came upon the group handing out shot glasses of beer, I said “what the heck?” and took one. It tasted awesome. I chatted with people around us, I high fived kids and I thanked every single person that was out there cheering and volunteering. As we approached the finish, I bragged on my first time marathon husband and that was SO fun. The race might not have been what I anticipated — but in the end, it was so much more. It was an important reminder to me about what really matters – and that isn’t BQs, times, or PRs. It’s people. And I’m so blessed to have so many amazing ones in my life. I’ll talk later this week about lessons learned and what I think was the cause of the cramps, but I wanted this recap to focus on all the good that came from last Saturday! Meghan had a great first marathon, K and I crossed the finish holding hands and I wouldn’t have had it any other way. Such a great day, such a great race and such a great city. Thank you, Richmond! Tell me: have you ever had a race not turn out like you planned but it ended up being perfect anyway? Tears. Again. So blessed to have people like you in my life. Beautiful post. Congrats on another marathon! Cramps always come back with a vengeance, and are such downers! I’ve always wanted to run Richmond, maybe next year I will finally sign up. 🙂 Great job! you should DEF run richmond – it’s wonderful! I love the way you talk about this race and how it ended up being so much more than what you had anticipated. It sounds like an amazing experience to share with K 🙂 I took the shot glass of beer with a what the heck shrug too and was amazed at how good it tasted at that point! hahaha, love that you also drank beer 🙂 so fun! What a great post, Courtney! So happy that you got to run what turned out to be a great race because you got to run it with your hubby. Any pain that we ever experience, as well as any disappointment that we ever have about not meeting a goal, always vanishes when we realize how much love we’re surrounded by. Crossing the finish line holding K’s hand is a memory that I’m sure neither of you will ever forget! 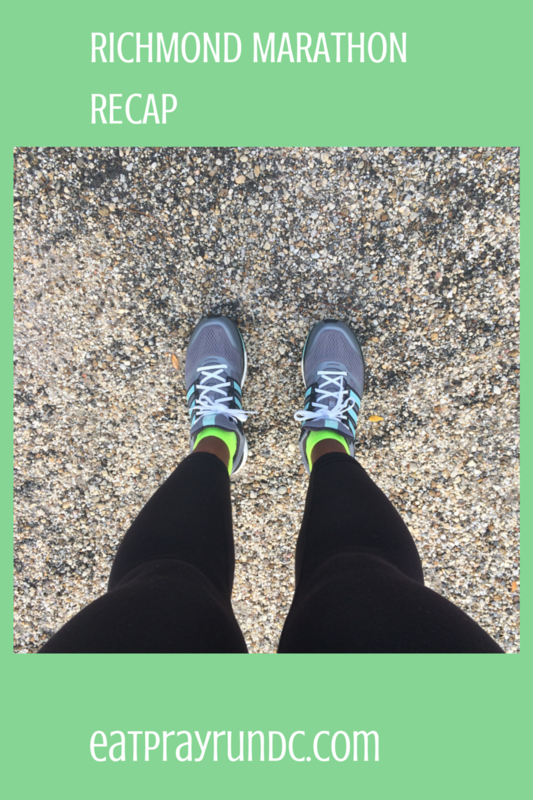 Kathryn @ Dancing to Running recently posted…How Will You Stayed Motivated During the Holidays? Well you were chipper about your less-than-perfect race, I was grouchasaurus rex! It’s pretty awesome you got to enjoy the race with your husband even if that wasn’t what you planned. Wish we had seen y’all this weekend! haha, i was NOT chipper during those middle miles, but then i just accepted it 🙂 SO bummed we didn’t get to meet up! You and K are the CUTEST! This is so sweet, and I love seeing how happy you are. Congrats on *another* marathon! Hate that you were in pain, but I’m so proud of you for sticking with it. Thanks for being an inspiration. thanks friend! love you and you inspire me too! thank you – it was frustrating, but keeping it all in perspective was so important. one bad race doesn’t erase all the training and work and gains i’ve had in a year! Can’t tell you how much I LOVE this post. You’re an amazing person. This is such great perspective. Congrats again on the marathon! thanks colleen – changing my perspective changed EVERYTHING about saturday for me! Everything happens for a reason and He knows what He is doing. Sounds like it was meant to be. You and your hubs conquering this together! Well, Courtney, I wish I could say that I’ve had a race that did not go as planned but still turned out well…maybe one of these days – ha! When I first saw your posts on Instagram, FB, etc., I felt sad because I just knew everything was going to click for you in this race after the training you did. After I thought about it for a moment, though, I thought, “how cool that she was able to finish with K during his FIRST marathon.” I mean, really? That’s pretty amazing. I’m so glad you’ve been able to bring some positive perspective to your experience; thanks so much for a great recap! This is so lovely! I’m so glad you were able to get through the pain and make the race a wonderful experience despite it. Congrats to you and K! thank you – it was a great weekend! <3 love love love this! Aww, I have chills reading this. Everything works out for a reason, and what a blessing to be able to experience that with your hubby. As you know MCM was bad for me, but looking back on it, I ‘m so thankful…I knew Lisa was a great friend, I’ve known her for years, but it really hit home how important our friendship is…and what friendship is really all about! yes. it really sometimes is about so much more than times. that was true friendship!! Way to finish strong Courtney! I’ve had races like that where everything imaginable went wrong but in the end it was a blessing in disguise. I love this! Your perspective change mid-race was amazing, and a true mark of your strength as a runner. It would have been so easy for you to shut down, but you didn’t. Congrats to you and your hubby for experiencing something incredible together! Cecilia @ mommiesrun recently posted…Things I thought were cool so maybe you will think they are cool too. thanks cecilia – it really was a game changer when i shifted my attitude! Absolutely loved reading this. So awesome that you changed your perspective and came out of a dark place to see the light and have an amazing experience. So awesome that you & your husband ran the whole thing together & crossed holding hands! Congratulations to the three of you! thank you – it turned out to be fantastic! Great job! Yes, I felt that way about my Zooma half marathon last summer. It was a terrible race for me…I felt awful and wanted to quit. But one of my friends came back and ran it with me…making one of my worst races one of my best races. Because running isn’t always about the finish time, right? you’re right – running isn’t always about the finish line! Another one of my friends had the same exact calf issue and she had never before had it either. Strange! I am sorry that your race didn’t turn out the way you’d planned but I love that you got to run with your hubby. Maybe it was meant to be. it’s hard to figure out cramps – it could be a number of different things so i stopped trying to figure it out. you’re right – it was meant to be! Way to keep it all in perspective. So sweet that you & your hubs have this memory of his first 26.2 to share together. Beautiful recap and what a special marathon for you and your husband! Glad it was a fabulous day! So sorry to hear about the cramp in your leg. But you were strong and kept going. And how awesome you got to run with your husband on his first marathon. Like you said, it’s the people you get to share it with that make it a great experience. Congrats to you both! thank you – it was an experience i’ll never forget! People over PRs. Love the way you look at it. Not every race can be perfect, but it is all about perspective and how we accept that. Amazing recap and congratulations on pushing through the cramps and bringing back the joy and fun of the race. I feel a lot of runners forget they should be having fun, as the marathon is the ice on a 18 week training cake, and if your not having fun and taking in the experience, your missing out on an essential part of a marathon. Again, congrats on your race finish! thank you so much for your kind words – we def had fun! Congrats, Courtney! I’m so happy that you had such a positive experience even though things didn’t go as planned. And running three marathons in one year is an amazing accomplishment! Richmond didn’t go as planned for me when I ran it in 2011 either. I, too, cried several times after mile 20 because my leg (I later learned it was sciatic nerve pain) hurt so badly. Bill stuck with me, and it ended up being one of the few (perhaps only) marathons that we stayed together for the entire race. Despite the negatives, I loved the beauty of the course, the spectators, and the friendly runners around us! I don’t even really like beer like that, but it tasted great right then! Jen@milesandblessings recently posted…Such an inspiring story!